¡¡¡¡¡ 2007 Event video highlights (below) !!!!! Every year, in September, the Madrid motorcross freestyle championship is played out at the Plaza de toros (Square of the bulls) in Las Ventas (Metro: Ventas). Consisting of a huge dirt mound in the center of the bullfighting ring the riders turn tricks and somersaults directly in front of the public in the stands. No need to look up or down.... the riders come to you! 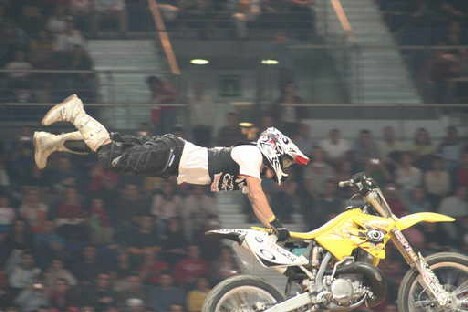 The 2007 Madrid motorcross Red bull x-fighters freestyle competition ended with a win for the ever dominate Travis Pastrama. The Madrid win on the 27th July was Travis´s second back to back title and was enough to win him the overall Red bull series. The redbull Xfighters tournament organizers will announce the date for thr 2008 Madrid motocross around February 2008 as a part of the four round competition. Other events in 2007 were in Mexico city 23rd March, Slane castle Ireland 26th May & Moscow on the 30th June. As soon as rider line ups and ticket details are confirmed we will bring you them here. Tickets were available for the 2007 event directly from the organisers of the Madrid Motorcross championship! Madrid guide Spain will bring you the details of the 2008 Madrid xfighters championship ticket prices just as soon as details are announced. Residents Tip: Arrive early to get the best seats / spot to watch from and take a fan /something to keep cool with as it can get hot!